01:25:00 Makes 16 servings, 1 cream puff (28 g) each. Makes 16 servings, 1 cream puff (28 g) each. You don't have to be an expert pastry chef to create delicate cream puffs at home. 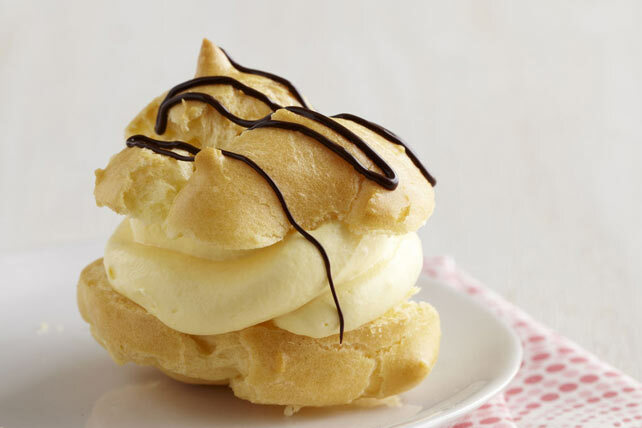 All you need to do is follow the 3 simple steps in our Cream Puffs recipe! Bring water and butter to boil in large saucepan. Add flour. Remove from heat. Stir vigorously until well blended. Return to heat; cook and stir on medium heat 2 min. or until mixture pulls away from side of pan and forms ball. Cool 5 min. Add eggs, 1 at a time, beating with wooden spoon after each until well blended. Drop, 2 inches apart, into 16 small mounds on baking sheets sprayed with cooking spray. Bake 25 min. or until golden brown. Remove to wire racks; cool completely. Meanwhile, beat pudding mix and milk in medium bowl with whisk 2 min. Stir in Cool Whip. Refrigerate until ready to use. Cut puffs horizontally in half with serrated knife; remove any soft dough from insides of puffs. Fill bottoms of puffs with pudding mixture; replace tops. Melt chocolate as directed on package; drizzle over cream puffs. This easy, yet elegant, dessert tastes great and can fit into a healthful eating plan! Serving Size Makes 16 servings, 1 cream puff (28 g) each.